Spirelli Punches. 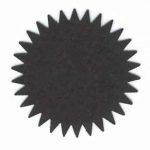 The punch is great for punching out a decorative disc for doing the Spirelli string art technique. Use the punch on thinner cardstock or a heavy weight parchment or vellum paper. The punch disc is approximately 3 inches in diameter.